By David L. Thomas, Jr.
Kathryn and I are away from home for many months of every year. At home we control our diet and thrive on whole-food, plant based meals. 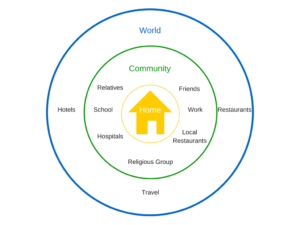 And in our community, we have talked about our dietary preferences with friends, family and neighbors, and also thrive based on the accommodations we have reached. 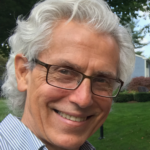 Our primary challenges these days are in the greater world where whole food, plant-based options are not the norm. 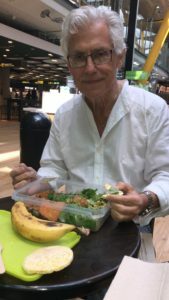 When we travel, we order vegan meals for the airplane ride which occasionally are edible and hunt in airports for plant-based options. Leaving nothing to chance, however, we also bring food with us for consumption before or after boarding our aircraft. We generally use glass containers for food storage at home but have a couple of light-weight plastic containers for travel. This assures us of one last home-cooked meal before we meet the challenges of the real world. 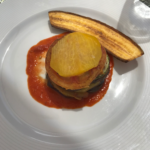 All too often we have caught ourselves assuming that options consistent with our lifestyle are not available, only to find that, when asked, restaurants, hotels, cruise lines and other places we must eat are not only willing but also are excited to present us with delicious, varied and elegant plant-based meals. Increasingly, we no longer just order a few side dishes or make compromises that neither please our palates nor make our bodies feel good. We speak up, politely, and explain the nature of what we would like to eat. 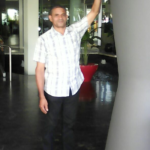 We just returned from a magnificent 7-day, all-inclusive stay in the Barceló Bávaro Beach Hotel near Punta Cana in the Dominican Republic. On our first day, we contacted the head chef, Roberto, through Guest Services. 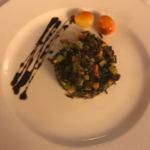 We explained that we wanted to eat gourmet meals like everyone else but composed of whole grains, legumes, vegetables, fruits, nuts, seeds, herbs and spices. Roberto immediately got very animated about all the dishes they could prepare using this palette of ingredients, saying that he would coach his personnel on how to make our eating experience very special. He did not disappoint! 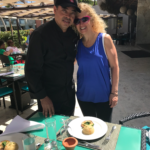 We ate lunch and half of our dinners in La Brisa, a beautiful space with a roof and no walls directly on the beach and run by Chef Facundo to whom we shall be eternally grateful. The other half of our dinners were enjoyed in the more upscale Chez Gourmet restaurant. 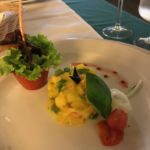 Each meal was different and the time and attention to the presentation of our food was evident. 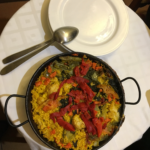 And starting from the first day we became welcomed and special guests in the two restaurants, greeted and served with great kindness and care. 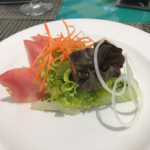 This experience in the Dominican Republic was consistent with our prior experiences with Norwegian Cruise Lines. 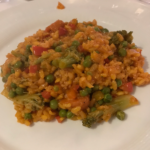 We spent 32 days on a ship going from Dubai to Hong Kong a couple of years ago and were treated to beautiful and nutritious meals every day that were whole food, plant-based. Chef José was with us the entire time and even prepared vegan cakes to help us celebrate the birthdays of each of us and our traveling companions. 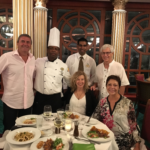 There were 15 restaurants on the ship and our “food ambassador” and Chef José made sure that each meal was perfect. Curiously, the only chef on board who himself was a vegan was in charge of the steak house restaurant. 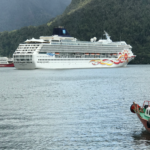 Earlier this year, we had a similar experience with Norwegian on a cruise from Santiago de Chile around Cape Horn to Buenos Aires. Again we were designated a food ambassador who made sure that each restaurant exceeded our needs and expectations. 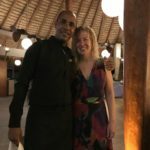 On the first cruise we had brought along some whole grain rice, quinoa, amaranth, buckwheat groats and millet to help out, and even bought a few additional supplies in Sri Lanka. On the second cruise, however, that was not necessary—the ship already had a sufficient supply of non-gluten whole grains. 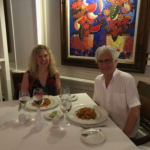 We have had similar experiences in many restaurants wherever we have traveled. 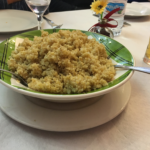 A few years ago, while walking a portion of the Camino de Santiago in Northern Spain, we brought along quinoa and brown rice, and restaurants were willing to cook them for us and add them to the meal. Large piles of these grains disappeared during our meals as plant-based eaters and omnivores alike dug in.  We believe that it is important to ask for what we need. Of course, this has the benefit of a better diet for ourselves. But equally importantly, by asking for a whole food, plant-based meal we are helping food establishments understand that there is a demand for whole food, plant-based meals and that the selection of a restaurant might be based on the availability of plant-based options. And, generally, the chefs have been excited by the challenge of doing something different and special. 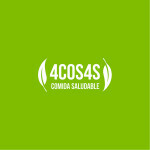 In promoting the 4 COS4S program on the island of Mallorca where we live, we have asked restaurants to put at least 4 things (4 cosas) on the menu that are whole food, plant-based. 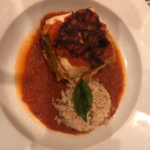 We are hopeful that, between our asking for this kind of meal and the demonstrated demand when this kind of meal is offered on the menu, restaurants will learn that there is a market for plant-based meals that can attract new clients and influence the choice of restaurant when some in the dining party are plant-based eaters. This is how the world can progress toward a healthier eating lifestyle, one meal at a time.